An inevitable part of any organized tour of China is the stops at factories or showrooms to show visitors the local crafts and products, in the hope that visitors will be enticed into spending some money. After our tour of the Great Wall of China we make one such stop with a visit to the Run-Ze Jade Garden for a tour of the Jade Showroom and lunch. 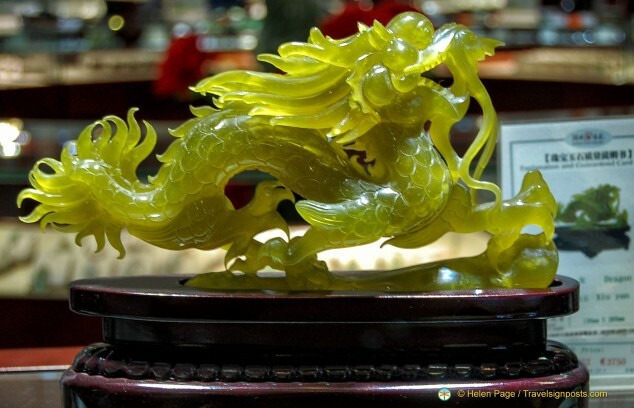 Jade is, and always has been, a stone highly prized by the Chinese. Its use in ornaments, ritual objects and ceremonial weapons can be traced back to 5,000 BC. In ancient times jade was a material associated with royalty and people of high status. Kings and nobles wore jades and upon their death, the jade is placed in their tombs to accompany them in the after-life. On arrival at the Jade Showroom we are greeted by our showroom guide who explains the process of jade carving and polishing and she then takes us on a tour of the showroom. Nephrite is a calcium magnesium silicate and is white in colour, however the presence of copper, chromium and iron gives it colour. The colours range from a subtle grey-green to bright yellows and reds. Jadeite is a sodium magnesium silicate and it comes in a bigger range of colours than nephrite. 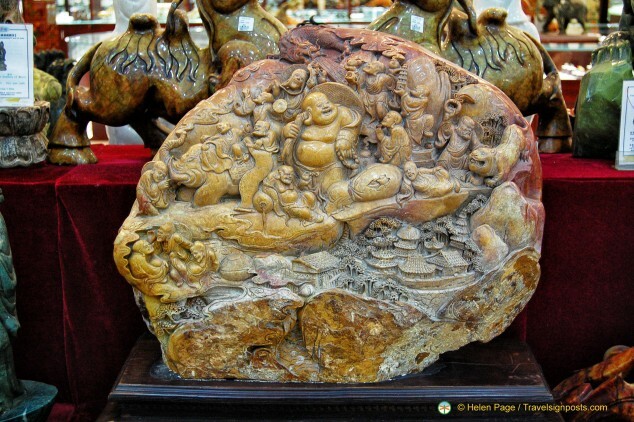 Jadiete is a newer stone, rarely used in China before the 18th century. 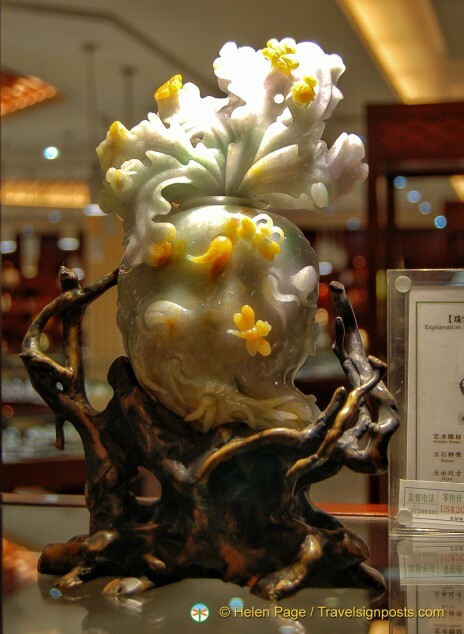 A quality piece of jade is translucent when held to the light. There are different colors of the jade, each one with its own symbolism. She also shows us some of the more traditional pieces of costume jewelry and when they are worn. 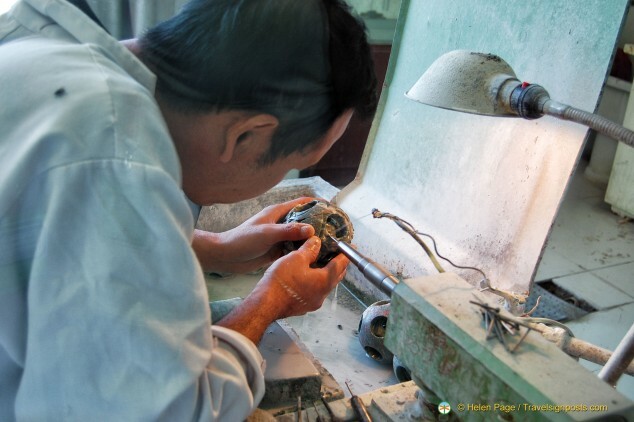 If you’ve ever wondered how layers of jade balls are created, a tradesman is on hand, carving a jade puzzle ball. 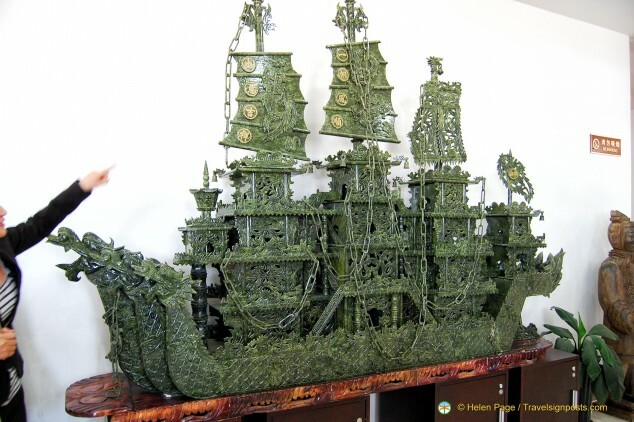 Amazingly, he carves the multi-layered balls from a single piece of jade, starting from the outside in. 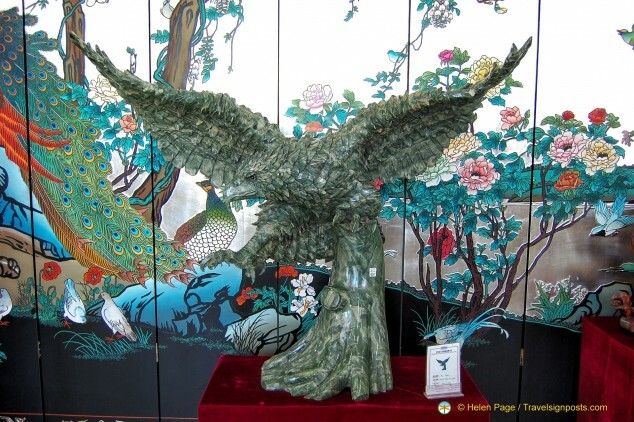 We are shown various large and intricate pieces of works, most of them carved from a single piece of jade. The Chinese galleon is above is pretty amazing, but one of my favourites is this piece of green jade dragon. 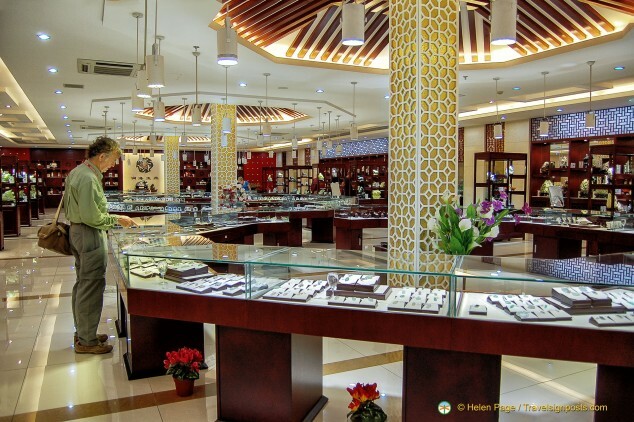 After our quick explanation about jade, we are given free time in the showroom full of all types of jewelry, ranging from jade earrings and rings, jade bracelets, jade pendants and more. A sales person follows you around so that sales opportunities are not missed. Some may find this annoying, but if you just accept that this is the practice in China, then you’ll feel less uncomfortable at being followed. 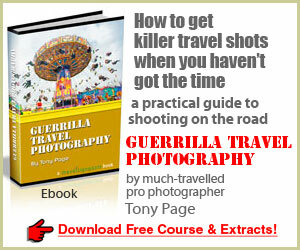 Unless you show interest in something, there’s really no pressure by the tailing sales person. In fact they can be useful in answering any queries you may have about jade. While the people in our group are busily buying pieces of jade jewellery for presents, we walk around the showroom admiring the exquisite pieces of jade objects. 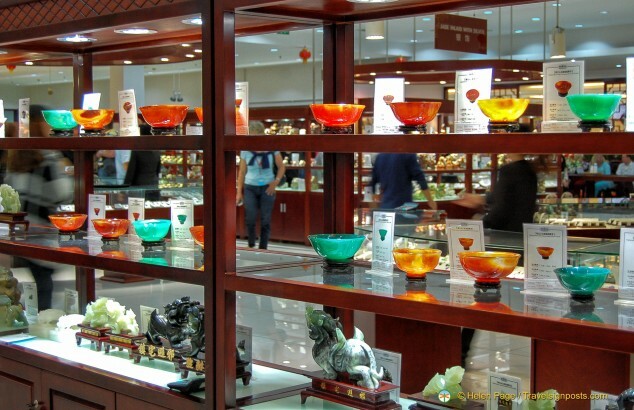 The colourful jade bowls are very nice as well. Whilst some may dislike these shopping stops on tours, we always think that they can be educative as you can learn about the particular craft. We didn’t spend a cent at the Jade Showroom but fully enjoy the chance to see the art of jade carving. From the Jade Showroom we proceed upstairs to a huge buffet hall where groups of tourists are having meals. The food arrive promptly and although it isn’t gourmet cooking, the food tastes fine. The Run-ze Jade Garden is a state-owned business and with your purchase you get a certificate of authenticity. The prices are not cheap, but you are assured of quality. We have however read, on Tripadvisor, of instances where customers have complained of having paid for inferior products (see link below). If you’re intending on buying an expensive piece of jade jewellery, it would be prudent to do your own research before parting with large sums of money. 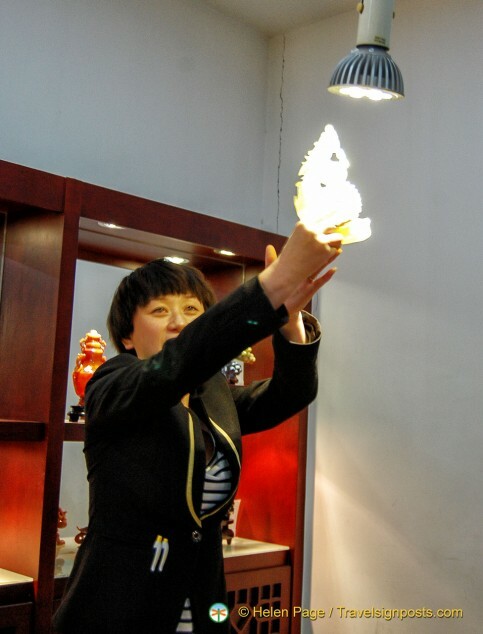 You can see more photos of our Beijing Jade Showroom visit Here.